Considering getting a Kerry Blue Terrier? The Kerry Blue Terrier originated from Ireland, whether it came from the Kerry County or Tipperary County is highly debated. This medium dog weighs 30 to 37 pounds and stands 44 to 48 centimetres at the withers. Since it is independent and strong willed, it can be challenging to train, making it unsuitable for first-time owners. It is a rare breed in the UK so people interested in caring for one need to be on a waiting list. Are you thinking of getting a Kerry Blue Terrier? Here is the breed profile of this gorgeous blue dog. The history behind the Kerry Blue Terrier breed is a mystery as varying stories surround it. The most popular one is that it originated in the mountainous country of Kerry in Ireland, thus the name. However, other experts believe it actually came from the Irish county of Tipperary with the Irish folklore saying a blue dog survived a shipwreck off the cost of Southern Ireland and swam ashore. Locals bred this fascinating blue-coated dog with the different terriers in the area, including the Wheaten Terrier, providing the foundation stock of the Kerry Blue Terrier. Kerry Blue Terriers became highly prized hunters and ratters because of their remarkable courage as well as guarding and herding instincts. They were also consistent at dog exhibitions and shows during the 1900s. However, this breed recognised under the Terrier group, has been placed on the vulnerable native breed list of The Kennel Club. With an average weight of 30 to 37 pounds and height of 44 to 48 centimetres, the Kerry Blue Terrier is a compact and proportioned breed that boasts of a lovely blue wavy hair. It has a well-balanced head that is flat on top, as well as strong a foreface. It has dark medium eyes that exude a vigilant and typical terrier expression. It also has v-shaped ears, a strong jaw with a perfect scissor bite and mouth and gums that are dark in colour. Its body is short with a good depth of brisket and well-sprung ribs. Its tail, which used to be customarily docked, is set high and erect. 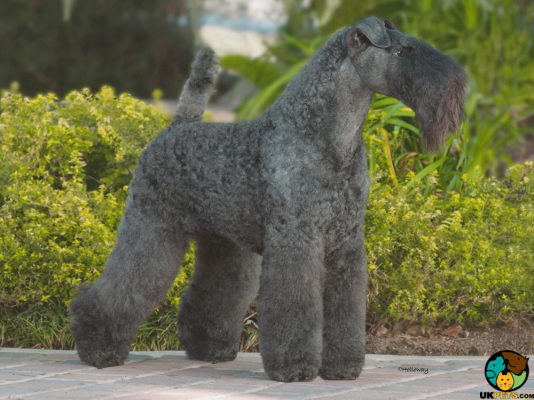 The most striking feature of the Kerry Blue Terrier is its blue astrakhan-type coat that is soft, silky, dense, and wavy. According to KC standards, the accepted colour for adult Kerry Blues is blue of any shade, with or without black points. It is permitted to have white hair on the chest. Puppies are generally born with black coats, which gradually turns blue as they turn 18 months. Kerry Blue Terriers have high grooming needs with their coats needing daily brushing especially around their muzzles. Although they do not shed heavily, their coats need trimming every 6 to 8 weeks, which is better off left to a professional groomer. This breed has a certain appearance to maintain that is difficult for owners to follow on their own. The hair between their pads should also be trimmed regularly. Other grooming requirements are regular trimming of nails, tooth brushing, ear cleaning, and skin inspection for bumps and fleas. The Kerry Blue Terrier is a hardworking, independent and confident dog. Males tend to be a bit aggressive in situations that are stressful and become dominant. This being said, the breed is not for inexperienced owners as it needs someone that is firm yet fair. Early socialisation and training are important so it learns its place in the pack, which is below everyone else at home. As a full-fledge terrier, it has a tendency to chase, dig and bark. People who are willing to put up with its tendencies will enjoy its high-spirited and silly attitude. Kerries are patient toward children but are better for families with older kids that know how to approach and handle dogs. Because it can be boisterous when playing, it can accidentally knock a toddler over. Regardless of the age of the child and the breed of the dog, parents need to supervise their kids and teach them to treat pets with kindness and respect. The Kerry Blue has a strong prey drive so it can be difficult when it comes to other pets and small animals. It can sometimes become aggressive and give chase. The Kerry Blue is intelligent but like most terriers, it is strong-willed, which makes it more challenging to train. As previously mentioned, it needs an experienced owner that could guide it to be obedient. Harsh correction would never work for this proud and independent breed so prepare a lot of patience and positive reinforcements. A typical serving for an adult Kerry Blue Terrier is 1.5 to 2 cups of excellent quality dry dog food per day. However, it is worth remembering that like in every breed, the amount of food you feed your Kerry Blue depends on its age, size, build, activity level, and metabolism. Work hand in hand with your veterinarian to determine if your dog is eating the right amount of food and has the right body weight, neither overweight nor underweight. The Kerry Blue Terrier is a medium breed that should be fed high quality food formulated for its size. It is also important to measure food, set a feeding schedule and avoid free-feeding. The number 1 ingredient in its food is protein, which can be in the form of beef, chicken, lamb, or fish. Dogs usually benefit from a grain-free diet, obtaining carbohydrates from complex sources such as sweet potatoes, carrots, berries, and other fruits and vegetables. Don’t forget to give your Kerry Blue omega fatty acids to maintain its gorgeous coat. Kerries can live up to 15 years when properly cared for and fed high quality food. It is generally a healthy breed but can be prone to certain hereditary health conditions like Cataracts, Dry eye, Entropion, Skin problems, Hip dysplasia, cysts, and cancer. If you notice anything unusual with your pet dog, immediately visit your trusted veterinarian. The Kerry Blue Terrier is a high-energy dog that needs at least an hour of daily physical and mental stimulation. Regular exercise is important in any type of dog as unmet exercise needs can lead to unwanted behaviour. Aside from walks, this type of terrier will enjoy playing games with you. When it is in a fenced area to be allowed to let off steam, make sure the fencing is secured or it will try to escape. Since the Kerry Blue Terrier is a rare breed in the UK, you will have to be on a waiting list to be able to obtain one. The cost of a well-bred pedigree puppy can range from £500 to £1,000. If you can afford to purchase one, will you be able afford the costs to properly raise it? Yes, caring for a dog can be very expensive. To start off, pet insurance expenses for basic coverage start at £20 a month. Initial equipment will be around £200. Food and treat costs will set you back £40 a month. Veterinary expenses can go as high as £900 a year especially during the first few months and the time your dog will be neutered or spayed. Preventive care will include vaccination and booster shots against deadly diseases, as well as deworming and flea treatments. As a rough estimate, you will need around £40 a month to care for a Kerry Blue Terrier, excluding the initial cost of purchasing the puppy. Is a Kerry Blue Terrier Right for You? The Kerry Blue Terrier is a medium breed that is fun-loving, independent and confident. It is smart but can be difficult to train because of its independent nature. This breed will thrive in the hands of experienced owners and families with older children. It has high grooming needs, which involves regular trimming at the groomer’s. The Kerry Blue is a rare breed in the UK.